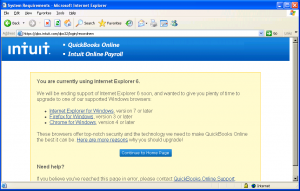 Up until a few months ago, the only way to use the Quickbooks Online interface was to do so through Internet Explorer. The interface did not work at all for people using browsers other than IE, which meant that it was wholly unavailable to Linux users and Mac users (I have no idea whether it worked on Mac’s version of IE or not, but I’m fairly certain it didn’t). Then, in October, the application was updated to begin working with Firefox on Windows and Safari on Mac. This was a step in the right direction, but still didn’t make the interface available to Linux users. A few weeks ago, however, I noticed two major changes in the Quickbooks Online application. Normally, in order to enter my time into Quickbooks, I would start up Windows XP in VirtualBox, then open Internet Explorer 6 (as I keep that browser installed in my virtual version of XP for testing purposes). 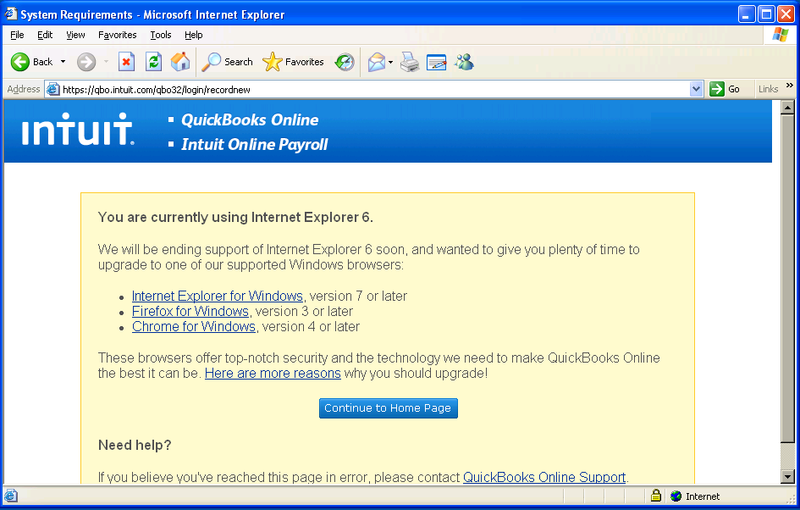 At that point, I was confronted with a warning message, informing me that Quickbooks would soon stop supporting IE6. Within that message, however, I found something a bit more interesting: in addition to IE7 and 8 and Firefox, Google Chrome was listed among the supported browsers. Now, the message I saw indicated that only Windows-based browsers were supported; but when I tweeted about it, someone from Intuit informed me that Mac browsers are also supported. I decided to do a little bit of independent testing. I opened Chrome in Linux and went to the Quickbooks site. The first time I tried it, once I logged in, I got the standard “Your browser is not supported” message. However, when I tried again a week or so later, I was able to log in and enter my time. So, for those of you that have to use Quickbooks Online to track time for your job; you are no longer bound to using Windows. You can now manage your time sheet from Windows, Mac or Linux.